Acces your customer area with your login details. Did you lose your login or password ? This module allows multi-site organisations management, perfectly adapted to groups that require specific financial accounting. This module is used in addition to the Stock management and enables accounting format exports. There is no more need to enter again the purchase data realised in the Stock management. According to the site and its organisation, it is possible to manage a financial accounting depending on the needs. 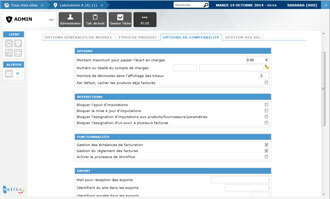 > Invoicing "stock" and "out of stock"
This feature enables the management and record of the invoices and assets and takes into account the supplier maintenances in the financial accounting plan. > Invoicing the "patient cost"
The invoicing can be "exact" or "planned". It is possible to charge depending on the quantity or the volume. Always according to the structure's needs. * The export is possible with certain accounting software interfaces, such as: Talentia, CPT/WIN, CEGID, CCMX Winner Expert and SAGE. 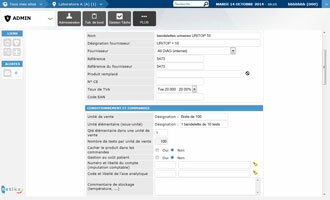 Netika is a French IT service provider, based in Strasbourg, dedicated to medical sector since 2000. Today, Netika is a key player in IT for medical biology laboratories and evolves around its 2 key products: KaliLab and KaliSil. With its third product KaliRad, Netika is targeting the medical imaging sector and is moving into new medical domains. Because we are keen to provide a quality service, our Quality Management Software and the related services are all certified NF Logiciel and answer a strict development and after sale support.